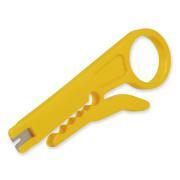 Detailed listing of our cable strippers. This precision Cat5 cable stripper is great for stripping any type of shielded (STP) or unshielded (UTP) twisted pair or other small round cabling. It features a nine position adjustment wheel that lets you precisely set the blade depth to strip thick or thin insulation without fear of nicking the inner wires or fibers. 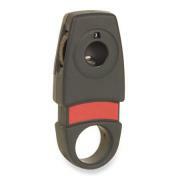 Its compact size makes it a perfect addition to any tool kit. Strips round cables 1/8" to 7/16" in diameter. Replaceable blade available separately. Please call for price. The Ideal Cat5 Cable Prep Tool is designed to easily strip the outer cable jacket, flatten, and separate the webbed conductors of category 5 cross-connect jumper wire and other UTP cable with webbed conductor pairs. This lightweight, compact stripper is inexpensive and simple to operate with adjustable blades to ensure nick-free strips. Use with twisted pair wire (UTP or STP), tightly wrapped stranded cables, CATV cable and other types of flexible power cords. Also works great on CAT 5 cabling. This tool strips from 3/16" to 5/16" O.D. 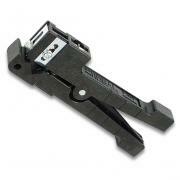 A second blade in the tip of the tool enables lengthwise slitting of the cable if needed. <p Includes three straight and one round blade. Unique design can both strip and slit the jacket lengthwise. 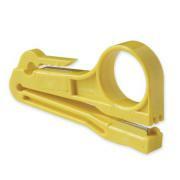 This lightweight, compact stripper is inexpensive, simple to operate and adjustable to ensure nick-free strips. 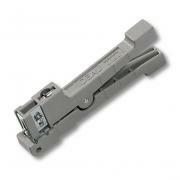 Removes the outside jacket from fiber optic cables. The 35134 strips cable from 1/8"to 7/32" (O.D.). Includes three straight and one round blade. The 35216 strips cable up to 1/8" (3.2 mm). Includes three straight and one round blade. 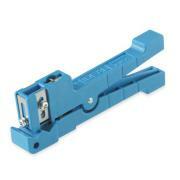 Specifically designed to inexpensively quickly measure, strip and cut UTP cables. Easy to use and economical, this handy disposable Cat5 stripper includes a 110-style punch tip and a length guide for gauging correct strip length. For RJ11 and RJ45 unshielded twisted pair wiring.